In 1865, a star was added, representing Nevada, bringing the total number of stars on the U.S. flag to 36. There were thirteen stripes representing the thirteen original colonies. NRS 235.020 State flag. The official flag of the State of Nevada is hereby created. The body of the flag must be of solid cobalt blue. On the field in the upper left quarter thereof must be two sprays of sagebrush with the stems crossed at the bottom to form a half wreath. Within the sprays must be a five-pointed silver star with one point up. The word "Nevada" must also be inscribed below the star and above the sprays, in a semicircular pattern with the letters spaced apart in equal increments, in the same style of letters as the words "Battle Born." Above the wreath, and touching the tips thereof, must be a scroll bearing the words "Battle Born." The scroll and the word "Nevada" must be golden-yellow. The lettering on the scroll must be black-colored sans serif gothic capital letters. The 1929 design was altered in 1987 so the name "NEVADA" is placed under the star, not spaced all around it. Motto of state is "BATTLE BORN" reflecting the formation of the state during the Civil War. The background color on Nevada flags is officially "cobalt blue", best matched at RGB 0-51-153. "The County Flag Array came about as a result of the Nevada Centennial in 1964. It was the brainchild of the Music Director at the Sands Hotel in Las Vegas, Mr. Antonio Morelli. His suggestion was passed to the Chairman of the Nevada Centennial Commission Mr. Thomas C. Wilson. 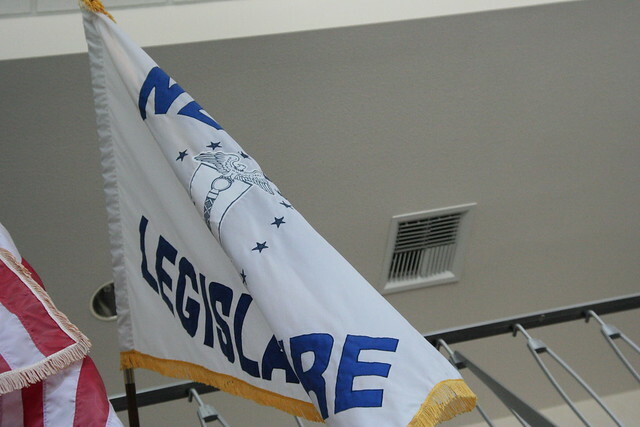 He requested that the county commissioners of all 17 Nevada counties consider adopting flags. As a result all of Nevada's counties began to solicit designs from schools, local artists, and designers. All the counties adopted official flags in time for their display on Nevada Day 1964. On that day a U.S. Marine Corps Honor Guard from the U.S. Navy Ammunition Depot at Hawthorne marched the new flags into the West portico of the capitol in Carson City and presented them to Governor Grant Sawyer in the name of the people of Nevada. Since then they have been used at the capitol building as well in numerous Nevada Day parades." There are two flags of the Governor of Nevada, one military and the other civil. The military version was updated in 1991 when the specifications were created for the state flag in 1991. While official, the Governor's flag has apparently fallen into disuse as the Governor's office according to Jim doesn't even know that the flag exists. The previous governor's flag had the letters NEVADA wrapped around the central star. Nevada's state seal has mountains, a mine, a railroad crossing a bridge, a plow, etc. The star and sagebrush badge was designed specifically for the flag. The state military crest, which is the crest used in the coats of arms of units of the National Guard, as granted by the precursor organizations of what is now the Army Institute of Heraldry. The official Institute of Heraldry blazon is "Within a garland of sagebrush a sledge and miner's drill crossed in saltire behind a pickaxe in pale proper."